There is rarely a project these days, particularly a residential project, where we don’t use Boxwoods of some type. Boxwoods have been a staple garden plant in Birmingham, especially in the “Over the Mountain” communities, for ages. They are cherised by many and there doesn’t seem to be a wide selection of other plants that accomplish the same look and yield the same design elements as Boxwoods. Beginning in 2013, and then again in the spring of 2015, a new fungal disease on Boxwoods, called Boxwood Blight, was detected in Alabama. In the spring of this year, it was detected in two different Mountain Brook landscapes. One was a new landscape installation where plants had been brought in from out-of-state. The other landscape was existing and had been in place for over 2 years. The latter incident is the most concerning because it is unknown how the disease entered the landscape. 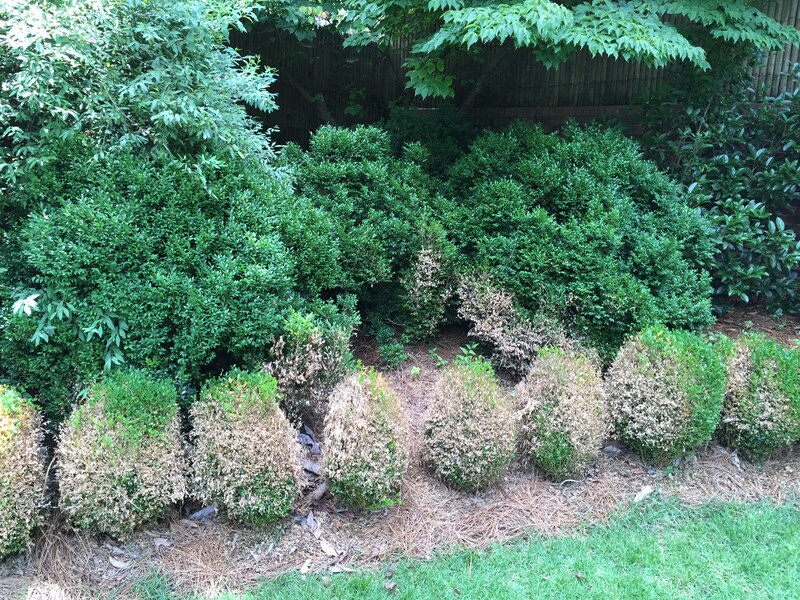 The blight spreads very easily from infected Boxwoods to other Boxwoods, and once plants are infected, they can begin to show symptoms very quickly. The disease can spread by touch, clothing, birds, pruning and maintenance equipment, and many other ways. Fungicide treatments can help as a preventative measure, but once infected only mask the symptoms and do not provide a long term cure. The plant will show leaf spots, defoliate, and eventually die. Blackjack Horticulture is in the process of developing a plan to help protect and offer preventative treatment options for our maintenance clients. If you have any questions, please feel free to contact us. In the meantime, click here for a link to synopsis of Boxwood Blight with other available resources listed at the bottom.